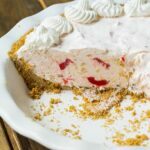 It’s officially summer and summer should be filled with easy, no-bake pies that are both cool and creamy like this Millionaire Pie. It’s full of crushed pineapple, pecans, and cherries and reminds me a little of Ambrosia or Watergate Salad. And like Ambrosia and Watergate Salad you’ve probably seen it at many cafeterias over the years. With just a few minutes of time, you can enjoy Millionaire Pie at home too. Sweetened condensed milk and Cool Whip make the filling super creamy and delicious. Just one bowl, a rubber spatula, and about 5 minutes is all you need to whip up this easy filling. 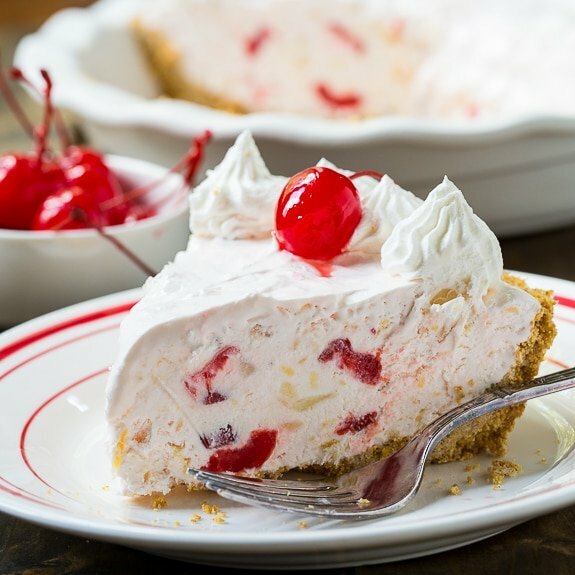 Maraschino cherries help flavor the pie. The pie filling gets put into a no-bake homemade graham cracker crust. It’s so nice to be able to make a summer pie without turning the oven on! Retro Millionaire Pie makes an easy summer dessert. 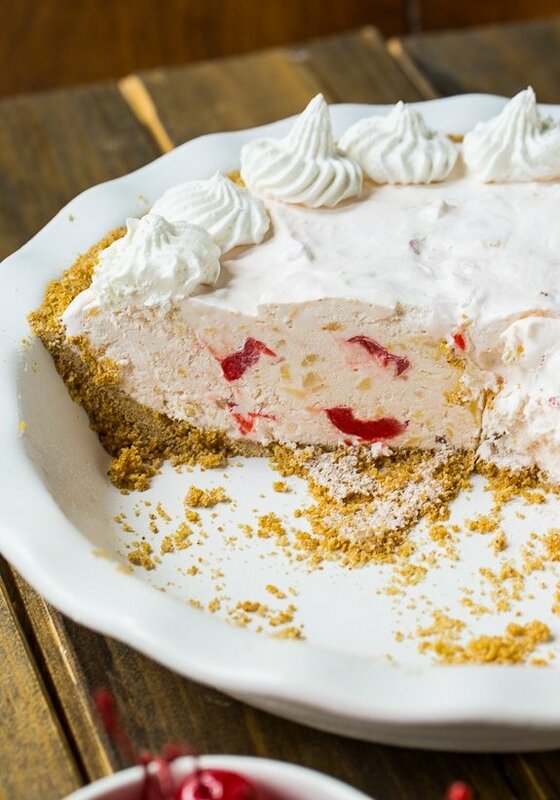 This no-bake pie is full of crushed pineapple, cherries, and pecans in a graham cracker crust. This entry was posted in Desserts, Pies and Tarts and tagged no bake, pie, pineapple, summer. Bookmark the permalink. Made this pie for a group of ladies and got mixed reviews. The cherries dominate the flavor and the pineapple is not very noticeable. It was like the cherry fluff stuff people make for dipping. 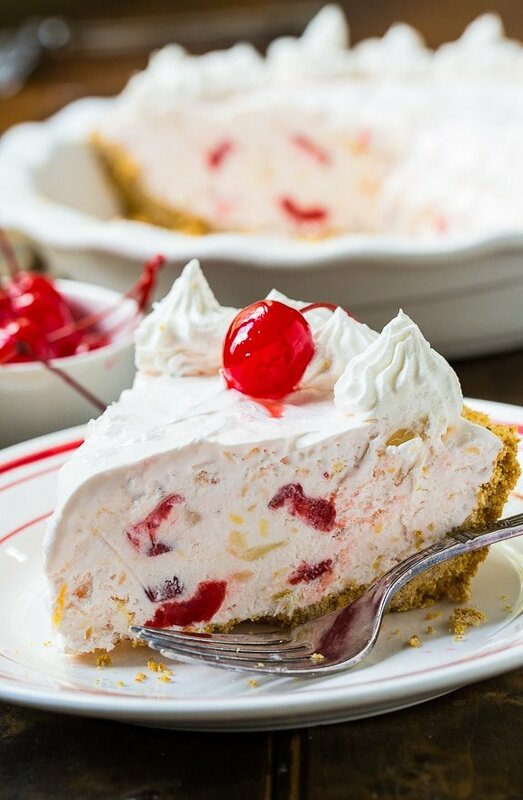 The cherries mixed into the filling turned the pie pink. Don’t know how to get it to look like the picture unless you maybe freeze the cherries before you fold them in. Very rich and a small slice goes a long way. Freezing briefly before serving did make for nice clean cuts. Such an interesting Pie ! 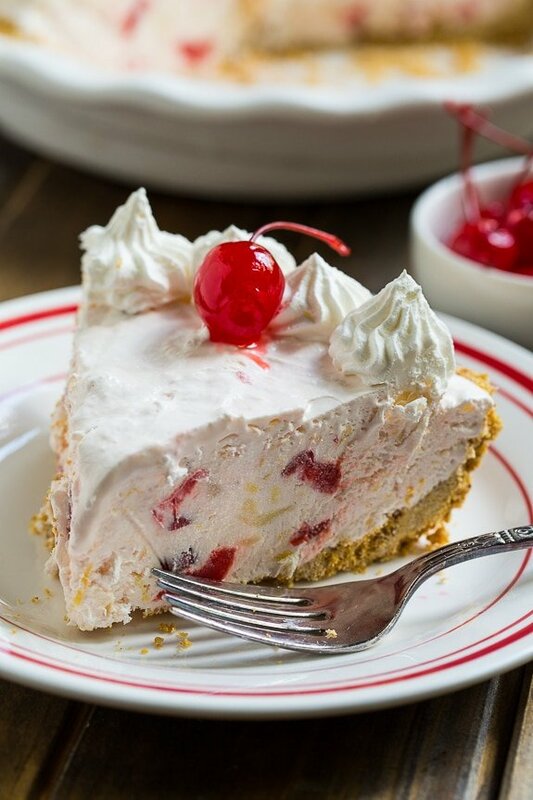 It was named Millionaire pie because the ingredients were once only used by the wealthy– pineapple, coconut, cherries had to be imported at a great price. That’s very interesting Tammy! Thanks for sharing! What is, and where do you get maraschino cherry juice? The juice from the jar of cherries? Yes, the juice from the jar. Crazy about the height of this pie.. wow it is incredible. And so perfect for Summer! Summer definitely calls for quick and easy no-bake desserts! This pie looks delicious, and it’s so pretty with the bits of pineapple and cherry! I love these easy no-bake pies! I feel like summer is going to be over before we know it — definitely going to have to sample this one before that happens! 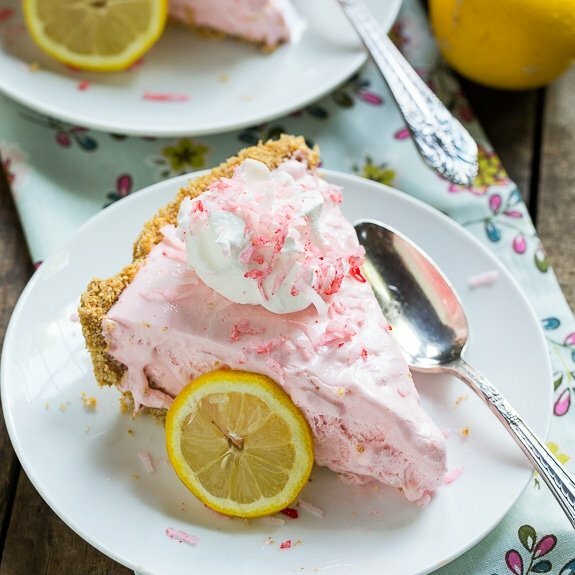 Love this no bake pie! It sounds delicious and I love how easy it is! I’d never heard of millionaire pie but I’m so glad I did! This looks like such a refreshing (no bake – woohoo!) dessert for summer. Plus that crust – yum! Sweet sweet sweet and yummy! Millionaire pie is such a fun name! No bake desserts are definitely key in the summer – I’d love to cool off with this! 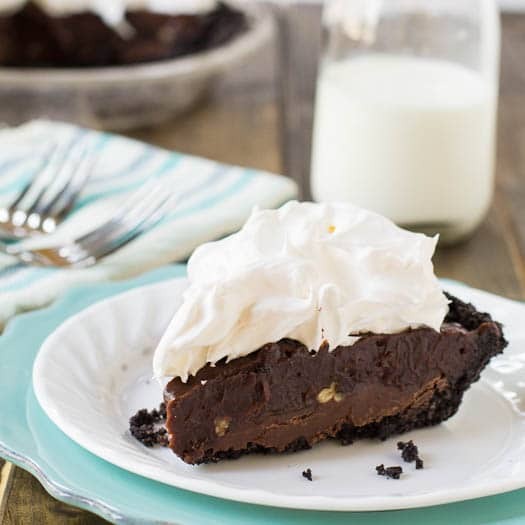 This millionaire pie looks beautiful, Christin! So fluffy, creamy and delicious! Yay for no-bake desserts, so perfect for summer! The add-ins DO look like gold and rubies, that’s a good guess as to how it might have gotten its name! Sounds delicious, and I LOVEE that it’s no bake! I’m hot and thirsty right now, and this pie looks exactly like what I need. You can’t go wrong with sweetened condensed milk and Cool Whip. oh my goodness. . this pie looks sooooo good! and perfect for summer! can’t wait to try this! Hooray for summer and no-bake pies! This pie looks gorgeous, Christin! No-bake desserts are a must for the summer, especially for delicious treats like this. And I love how versatile sweetened condensed milk is! Looks delicious! Pinned! Love the sound of this pie! Looks delicious – loving the flavours and of course the fact it’s no-bake too!